Craftster Community > CROCHET > Crochet: Completed Projects (Moderator: pottermouth) > my perdy neapolitan scarf and hat! my perdy neapolitan scarf and hat! Re: my perdy neapolitan scarf and hat! couldn't have said it better. wow your eyes! very catching. looks great on you. I don't believe in ghosts, bigfoot, or flaking on your swap partner! I love the color combo! Great hat and scarf. i LOVE yours!!! what kind of yarn did you use to get that pink? i was actually afraid my pink was too light and would blend too much with the white, but it was either that or "watermelon" LOL. but yours is really cute, i love the stripes. i may have to make a version 2.0 lol. i LOVE yours!!! what kind of yarn did you use to get that pink? I tell ya, I wasn't sure about that pink...my niece came for a visit and she picked out the colors, I was going to go with a softer pink like yours...but it's her scarf, so I used it...It's really much more vibrant than the pictures show, but I love the way it came out....I used el cheapo red heart super saver....Light Raspberrry 0774....I also used Aran 0313 (which is an off-white creamy color) and then the brown...don't have the label anymore on that one...your yarn looks a lot softer than mine, which kind did you use? leesespieces - those are spiffy! i really love it! so simple and cute! you did an amazing job! Great minds do think alike. 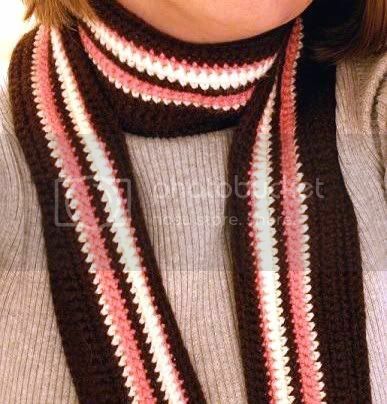 I've been eyeing the Simply Soft chocolate, pink, and off-white yarn ever since I saw a previous Craftster post a Neapolitan scarf, but I keep making myself put it back on grounds I don't need it and don't know anyone to make it for. Glad to see someone else has had good results with it, though. Does wearing it ever make you want ice cream? I swear looking at the yarn one day in the store made me start craving Neapolitan ice cream later on. Not that I ever need help craving the chocolate part.